The Avro Canada CF-105 Arrow was a delta-winged interceptor aircraft, designed and built by Avro Aircraft Limited (Canada) in Malton, Ontario, Canada, as the culmination of a design study that began in 1953. Considered to be both an advanced technical and aerodynamic achievement for the Canadian aviation industry, the CF-105 held the promise of Mach 2 speeds at altitudes exceeding 50,000 ft (15,000 m), and was intended to serve as the Royal Canadian Air Force's primary interceptor in the 1960s and beyond. Not long after the 1958 start of its flight test program, the development of the Arrow (including its Orenda Iroquois jet engines) was abruptly and controversially halted before the project review had taken place, sparking a long and bitter political debate. The controversy engendered by the cancellation and subsequent destruction of the aircraft in production, remains a topic for debate among historians, political observers and industry pundits. "This action effectively put Avro out of business and its highly skilled engineering and production personnel scattered... The incident was a traumatic one... and to this day, many mourn the loss of the Arrow." In the post-Second World War period, the Soviet Union began developing a capable fleet of long-range bombers with the ability to deliver nuclear weapons across North America and Europe. The main threat was principally from high-speed, high-altitude bombing runs launched from the Soviet Union travelling over the Arctic against military bases, built-up and industrial centres in Canada and the United States. To counter this threat, Western countries strenuously engaged in the development of interceptors that could engage and destroy these bombers before they reached their targets. A. V. Roe Canada Limited had been set up as a subsidiary of the Hawker Siddeley Group in 1945, initially handling repair and maintenance work for aircraft at Malton, Ontario Airport, today known as Pearson International Airport. The next year the company began the design of Canada's first jet fighter for the Royal Canadian Air Force, the Avro CF-100 Canuck all-weather interceptor. The Canuck underwent a lengthy and troubled prototype stage before entering service seven years later in 1953, nevertheless it went on to become one of the most enduring aircraft of its class, serving in a variety of roles until 1981. Recognizing that the delays that impacted the development and deployment of the CF-100 could also impact its successor, and the fact that the Soviets were working on newer jet-powered bombers that would render the CF-100 ineffective, the RCAF began looking for a supersonic, missile-armed replacement for the Canuck even before it had entered service. In March 1952, the RCAF's Final Report of the All-Weather Interceptor Requirements Team was submitted to Avro Canada. Avro engineering had been considering supersonic issues for some time at this point. Supersonic flight works in a very different fashion and presents a number of new problems. One of the most critical, and surprising, was the sudden onset of a new form of drag, known in the West as wave drag. Wave drag was so powerful, engines of the era could not provide enough power to overcome it, leading to the concept of a "sound barrier". German research during the Second World War had shown the onset of wave drag was greatly reduced by using airfoils that varied in curvature as slowly as possible. This suggested the use of thinner airfoils with much longer chord than what designers would have used on subsonic aircraft. These designs were impractical because they left little internal room in the wing for armament or fuel. However, they also discovered it was possible to "trick" the airflow into the same behaviour if a conventional thicker airfoil was used, swept rearward at a sharp angle, creating a swept-wing. This provided many of the advantages of a thinner airfoil while also retaining the internal space needed for strength and fuel storage. Another advantage was that the wings were clear of the supersonic shock wave generated by the nose of the aircraft. Almost every fighter project in the postwar era immediately applied the concept, which started appearing on production fighters in the late 1940s. Avro engineers had previously explored swept-wing and tail modifications to the CF-100 known as the CF-103, which had proceeded to wooden mock-up stage, and offered improved transonic performance with supersonic abilities in a dive. However, the basic CF-100 continued to improve through this period, and the advantages were eroded. "At the time we laid down the design of the CF-105, there was a somewhat emotional controversy going on in the United States on the relative merits of the delta plan form versus the straight wing for supersonic aircraft... our choice of a tailless delta was based mainly on the compromise of attempting to achieve structural and aeroelastic efficiency, with a very thin wing, and yet, at the same time, achieving the large internal fuel capacity required for the specified range." An innovative aspect of the design was the delta-wing design. The delta-wing had many of the same advantages of the swept wing in terms of transonic and supersonic performance, but offered much more internal room and overall surface area. This provided more room for fuel, an important consideration given the inefficient early jet engines of the era, and the large wing area provided ample lift at high altitudes. The delta-wing enabled slower landings than swept wings in certain conditions. The disadvantages of the design were increased drag at lower speeds and altitudes, and especially higher drag while maneuvering. For the interceptor role these were minor concerns, as the aircraft would be spending most of its time flying in straight lines at high altitudes and speeds, mitigating these disadvantages. Further proposals based on the delta wing resulted in two versions of the design known as C104: the single engine C104/4 and twin-engined C104/2. The designs were otherwise similar, using a low-mounted delta-wing; the primary advantages of the C104/2 were a larger overall size which offered a much larger internal weapons bay, at the time a cutting-edge feature in a fighter, and gave twin-engine reliability. The proposals were submitted to the RCAF in June 1952. Intensive discussions between Avro and the RCAF examined a wide range of alternative sizes and configurations for a supersonic interceptor, culminating in RCAF "Specification AIR 7-3" in April 1953. AIR 7-3 called specifically for crew of two, twin engines, with a range of 300 nautical miles (556 km) for a normal low-speed mission, and 200 nmi (370 km) for a high-speed interception mission. It also specified operation from a 6,000 ft (1,830 m) runway; a Mach 1.5 cruising speed at an altitude of 70,000 ft (21,000 m); and manoeuvrability for 2 g turns with no loss of speed or altitude at Mach 1.5 and 50,000 ft. The specification required five minutes from starting the aircraft's engines to reaching 50,000 ft altitude and Mach 1.5. It was also to have turn-around time on the ground of less than 10 minutes. An RCAF team led by Ray Foottit visited U.S. aircraft producers and surveyed British and French manufacturers before concluding that no existing or planned aircraft could fulfill these requirements. Avro submitted their modified C105 design in May 1953, essentially a two-man version of the C104/2. A change to a "shoulder-mounted" wing allowed rapid access to the aircraft's internals, weapons bay, and engines. The new design also allowed the wing to be built as a single structure sitting on the upper fuselage, simplifying construction and improving strength. The wing design required a long main landing gear that still had to fit within the thin delta wing, presenting an engineering challenge. Five different wing sizes were outlined in the report, ranging between 1,000 ft and 1,400 ft (93 m to 130 m); the 1,200 ft (111 m) sized version was eventually selected. The engines considered for the aircraft were the Curtiss Wright J-67, the Bristol Olympus OL-3 or the Orenda TR.9 engines. Armament was stored in a large internal bay located in a "belly" position, taking up over one third of the aircraft fuselage. A wide variety of weapons could be deployed from this bay, such as the Hughes Falcon guided missile, the CARDE Velvet Glove air to air missile, or four general-purpose 1,000 lb bombs. The Velvet Glove radar-guided missile had been under development with the RCAF for some time, but was proved unsuitable for supersonic speeds and lacked development potential, consequently further work on that project was cancelled in 1956. In July 1953, the proposal was accepted and Avro was given the go-ahead to start a full design study under the project name: "CF-105". In December, CA$27 million was provided to start flight modelling. At first, the project was limited in scope, but the introduction of the Soviet Myasishchev M-4 Bison jet bomber and the Soviet Union's testing of a hydrogen bomb dramatically changed Cold War priorities. In March 1955, the contract was upgraded to CA$260 million for five Arrow Mk.1 flight-test aircraft, to be followed by 35 Arrow Mk. 2s with production engines and fire-control systems. In order to meet the timetable set by the RCAF, Avro decided that Arrow program would adopt the Cook-Craigie plan; effectively eliminating the prototype phase, the first test airframes were constructed on production jigs. Any changes would be incorporated into the jigs while testing continued, with full production starting when the test program was complete. As Jim Floyd noted at the time, this was a risky approach, however: "...it was decided to take the technical risks involved to save time on the programme... I will not pretend that this philosophy of production type build from the outset did not cause us a lot of problems in Engineering. However, it did achieve its objective." In order to mitigate risks, a massive testing program was started. By mid-1954, the first production drawings were issued and wind tunnel work began, along with extensive computer simulation studies carried out both in Canada and the United States utilizing sophisticated computer programs. In a related program, nine instrumented free-flight models were mounted on solid fuel Nike rocket boosters and launched from Point Petre over Lake Ontario while two additional models were launched from the NACA facility at Wallops Island, Virginia, over the Atlantic Ocean. These models were for aerodynamic drag and stability testing, flown to a maximum speed of Mach 1.7+ before intentionally crashing into the water. Experiments showed the need for only a small number of design changes, mainly involving the wing profile and positioning. To improve high-alpha performance, the leading edge of the wing was drooped, especially on outer sections, a dog-tooth was introduced to control spanwise flow, and the entire wing given a slight negative camber which helped control trim drag and pitch-up. The area rule principle, made public in 1952, was also applied to the design. This resulted in several changes including the addition of a tailcone, sharpening the radar nose profile, thinning the intake lips, and reducing the cross-sectional area of the fuselage below the canopy. The aircraft used a measure of magnesium and titanium in the fuselage, the latter limited largely to the area around the engines and to fasteners. Titanium was still expensive and not widely used because it was difficult to machine. The construction of the airframe itself was fairly conventional, however, with a semi-monocoque frame and multi-spar wing. The Arrow's thin wing required aviation's first 4,000 lb/in (28 MPa) hydraulic system to supply enough force to the control surfaces, while using small actuators and piping. A rudimentary fly-by-wire system was employed, in which the pilot's input was detected by a series of pressure-sensitive transducers in the stick, and their signal was sent to an electronic control servo that operated the valves in the hydraulic system to move the various flight controls. This resulted in a lack of control feel; because the control stick input was not mechanically connected to the hydraulic system, the variations in back-pressure from the flight control surfaces that would normally be felt by the pilot could no longer be transmitted back into the stick. To re-create a sense of feel, the same electronic control box rapidly responded to the hydraulic back-pressure fluctuations and triggered actuators in the stick, making it move slightly; this system, called "artificial feel", was also a first. In 1954, the RB.106 program was cancelled, necessitating the use of the backup J67 engine instead. In 1955, this engine was also cancelled, leaving the design with no engine. At this point, the Pratt & Whitney J75 was selected for the initial test-flight models, while the new TR 13 engine was developed at Orenda for the production Mk 2s. After evaluating the engineering mock-ups and the full-scale wooden mock-up in February 1956, the RCAF demanded additional changes, selecting the advanced RCA-Victor Astra fire-control system firing the equally advanced United States Navy Sparrow II in place of the MX-1179 and Falcon combination. Avro vocally objected on the grounds that neither of these were even in testing at that point, whereas both the MX-1179 and Falcon were almost ready for production and would have been nearly as effective for "a very large saving in cost". The Astra proved to be problematic as the system ran into a lengthy period of delays, and when the USN cancelled the Sparrow II in 1956, Canadair was quickly brought in to continue the Sparrow program in Canada, although they expressed grave concerns about the project as well and the move added yet more expense. Go-ahead on the production was given in 1955. The rollout of the first CF-105, marked as RL-201, took place 4 October 1957. The company had planned to capitalize on the event, inviting more than 13,000 guests to the occasion. Unfortunately for Avro, the media and public attention for the Arrow rollout was dwarfed by the launch of Sputnik the same day. The J75 engine was slightly heavier than the PS-13, and therefore required ballast to be placed in the nose to return the center of gravity to the correct position. In addition, the Astra fire-control system was not ready, and it too, was replaced by ballast. The otherwise unused weapons bay was loaded with test equipment. "The aircraft, at supersonic speeds, was pleasant and easy to fly. During approach and landing, the handling characteristics were considered good.... On my second flight... the general handling characteristics of the Arrow Mark 1 were much improved.... On my sixth and last flight... the erratic control in the rolling plane, encountered on the last flight, [was] no longer there... Excellent progress was being made in the development... from where I sat the Arrow was performing as predicted and was meeting all guarantees." RL-201 first flew on 25 March 1958 with Chief Development Test Pilot S/L Janusz Żurakowski at the controls. Four more J75-powered Mk 1s were delivered in the next 18 months. The test flights, limited to "proof-of-concept" and assessing flight characteristics, revealed no serious design faults. The CF-105 demonstrated excellent handling throughout the flight envelope, a large part due to the natural qualities of the delta-wing, but responsibility can also be attributed to the Arrow's stability augmentation system. The aircraft went supersonic on its third flight and, on the seventh, broke 1,000 mi/h (1,600 km/h) at 50,000 ft (15,000 m), while climbing and accelerating. A top speed of Mach 1.98 was achieved, however this was not at the limits of its performance. Although no major problems were encountered during the initial testing phase, some minor issues with the landing gear and flight control system, had to be rectified. The former problem was partly due to the tandem main landing gear being very narrow, in order to fit into the wings; the leg shortened in length and rotated as it was stowed. During one landing incident the chain mechanism (used to shorten the gear) in the Mark 1 gear jammed, resulting in incomplete rotation. In a second incident with Arrow 202 on 11 November 1958, the flight control system commanded elevons full down at landing; the resulting reduction in weight on the gears reduced the effective tire friction, ultimately resulting in brake lockup and subsequent gear collapse. A photograph taken of the incident proved inadvertent flight control activation had caused the accident. The stability augmentation system also required much fine-tuning. Although the CF-105 was not the first aircraft to use such a system, it was one of the first of its kind, and was consequently problematic. By February 1959, the five aircraft had completed the majority of the company test program and were progressing to the RCAF acceptance trials. From 1953 onwards, some senior Canadian military officials at the Chief of Staffs began to question the program.It was not until June 1957, however, when the governing Liberals lost the federal election and a Progressive Conservative government under John Diefenbaker took power, that the aircraft's fate began to noticeably change. Diefenbaker, from the Canadian west, had campaigned on a platform of reining in what the Conservatives claimed was "rampant Liberal spending." The Arrow was not the only major industrial project targeted during the campaign, others such as the "million dollar monster" postal sorting computer from Ferranti Canada were singled out for additional political scorn. A criticism that had been voiced in the 1950s in the media was that Avro Canada as a company had little interest in competing with its products on the market, and instead had come to rely solely upon the availability of government financing for its activities. Nonetheless, by 1958, the parent company had become Canada's third largest business enterprise and had primary interests in rolling stock, steel and coal, electronics and aviation with 39 different companies under the A. V. Roe Canada banner. In August 1957, the Diefenbaker government signed the NORAD (North American Air Defense) Agreement with the United States, making Canada a partner with American command and control. The USAF was in the process of completely automating their air defense system with the SAGE project, and offered Canada the opportunity to share this sensitive information for the air defence of North America. One aspect of the SAGE system was the BOMARC nuclear-tipped anti-aircraft missile. This led to studies on basing BOMARCs in Canada in order to push the line further north, however the deployment was evaluated as being extremely costly. Defence against ballistic missiles was also becoming a priority. The existence of Sputnik had also raised the spectre of attack from space, and, as the year progressed, word of a "missile gap" began spreading. An American brief of the meeting with Pearkes reported Pearkes "stated that the problem of developing a defence against missiles while at the same time completing and rounding out defence measures against manned bombers posed a serious problem for Canada from the point of view of expense". It is also said Canada could afford the Arrow or Bomarc/SAGE, but not both. By 11 August 1958, Pearkes requested cancellation of the Arrow, but the Cabinet Defence Committee (CDC) refused. He tabled it again in September, and recommended installation of the Bomarc missile system. The latter was accepted but, again, the CDC refused to cancel the entire Arrow program. The CDC wanted to wait until a major review in 31 March 1959, however, the Sparrow/Astra system was cancelled in September 1958. Efforts to continue the program through cost-sharing with other countries were then explored. Canada tried to sell the Arrow aircraft to the U.S. and Britain, but had no takers. The aircraft industry in both countries was considered a national interest and the purchase of foreign designs was rare; and in this era the Arrow was far from the only heavy high-speed interceptor to end in cancellation. From 1955 onwards, the UK had shown considerable interest in the Arrow; in April 1956, the UK's Air Council recommended a purchase of 144 Arrows for the RAF to serve alongside the Saunders-Roe SR.177 mixed power interceptor, instead of the "thin-wing" Gloster Javelin then under study. The CF-105 would serve as a stopgap until the UK's F.155 project came to fruition; however with the F.155 due in 1963 and the Arrow not likely to reach the RAF before 1962, there was little point in proceeding. The infamous 1957 Defence White Paper, described as "the biggest change in military policy ever made in normal times", led to the cancellation of almost all British manned fighter aircraft then in development, and completely curtailed any likelihood of a purchase. In January 1959, the UK's final answer was no; and introduced an offer to sell Canada the English Electric Lightning instead. Acting on media speculation that the Iroquois engine program was also in jeopardy of being cancelled, the French government whose original intention was to place a major order for 300 Iroquois engines for the Dassault Mirage IV bomber, chose to end negotiations in October 1958 and opted for the indigenous SNECMA Atar engine. The US Air Force had already developed three aircraft with performance intended to be broadly similar to the Arrow, originally as part of their "1954 Interceptor" project-the McDonnell F-101B Voodoo, Convair F-102 Delta Dagger and Convair F-106 Delta Dart. Additionally two more advanced interceptors, the Republic XF-103 and North American XF-108, were under development, although both would ultimately be cancelled in the early design and mock-up phases. The U.S. decision to cancel many of their own interceptors, along with a firm rejection of an offer to procure Arrows for their own use, added weight for the justification of cancelling the Arrow. In 1958, Avro Aircraft Limited President and General Manager Fred Smye elicited a promise from the USAF to "supply, free, the fire control system and missiles and if they would allow the free use of their flight test centre at... Edwards AFB". The Arrow's cancellation was announced on 20 February 1959. The day became known as "Black Friday" in the Canadian aviation industry. -Prime Minister Diefenbaker addressing the House of Commons, 20 February 1959. The decision to terminate the program immediately put 14,528 Avro employees out of work, as well as nearly 15,000 other employees in the Avro "supply chain" of outside suppliers. Declassified records show Avro management was caught unprepared by the suddenness of the announcement by the government; while executives were aware that the program was in jeopardy, they expected it to continue until the March review. It was widely believed that during this lead-up to the review, the first Arrow Mk 2, RL-206, would be prepared for an attempt at both world speed and altitude records. An attempt was made to provide the completed Arrows to the National Research Council of Canada as high-speed test aircraft. The NRC refused, noting that without sufficient spare parts and maintenance, as well as qualified pilots, the NRC could make no use of them. A similar project initiated by the Royal Aircraft Establishment (Boscombe Down) had resulted in Avro Vice-President (Engineering) Jim Floyd's preparing a transatlantic ferry operation. This proposal, like others from the United States, was never realized. Within two months of the project cancellation, all aircraft, engines, production tooling and technical data were ordered scrapped. Officially, the reason given for the destruction order from Cabinet and the Chiefs of Staff was to destroy classified and "secret" materials utilized in the Arrow/Iroquois programs. The action has been attributed to Royal Canadian Mounted Police fears that a Soviet "mole" had infiltrated Avro, later confirmed to some degree in the Mitrokhin archives. Rumours had circulated that Air Marshal W.A. Curtis, a World War I ace who headed Avro, had ignored Diefenbaker and spirited one of the Arrows away to be saved for posterity. These rumours were given life in a 1968 interview, when Curtis was asked point-blank if the rumour was true. He replied: "I don't want to answer that." He proceeded to question the wisdom of printing the story of a missing Arrow, and wondered whether it would be safe to reveal the existence of a surviving airframe only nine years later. "If it is in existence it may have to wait another 10 years. Politically it may cause a lot of trouble." The fanciful legend endures that one of the prototypes remains intact somewhere. Following the Canadian government's cancellation of the Avro Arrow project in 1959, CF-105 Chief Aerodynamicist Jim Chamberlin led a team of 25 engineers to NASA's Space Task Group to become lead engineers, program managers, and heads of engineering in NASA's manned space programs-Projects Mercury, Gemini and Apollo. This team would eventually grow to 32 Avro engineers and technicians, and become emblematic of what many Canadians viewed as a "brain drain" to the U.S. Many other engineers, including Jim Floyd, found work abroad in either the UK or the United States. Work undertaken by both Avro Canada and Floyd benefited supersonic research at Hawker Siddeley, Avro Aircraft's UK parent, and contributed to programs such as the HSA.1000 supersonic transport design studies were ultimately influential in the design of the Concorde. Picture - Avro CF-105 Arrow nose section at the Canada Aviation and Space Museum showing torch cut marks where the nose was severed. In 1961, the RCAF obtained 66 CF-101 Voodoo aircraft, one of the American designs the RCAF originally rejected, to serve in the role originally intended for the Avro Arrow. The controversy surrounding this acquisition, and Canada's acquiring nuclear weapons for the Voodoos and Bomarcs eventually contributed to the collapse of the Diefenbaker government in 1963. 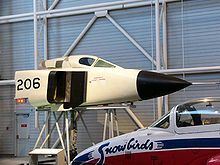 Although nearly everything connected to the CF-105 and Orenda Iroquois programs was destroyed, the cockpit and nose gear of RL-206, the first Mk 2 Arrow, and two outer panels of RL-203's wings were saved and are on display at the Canada Aviation and Space Museum in Ottawa, alongside an Iroquois engine. With specifications comparable to then-current offerings from American and Soviet design bureaus, at the time of its cancellation, the Arrow was considered by one aviation industry observer to be one of the most advanced aircraft in the world. The Arrow Mark 1 was the initial version powered by two Pratt & Whitney J75 turbojet engines that produced 23,500 pounds-force (105 kN) of thrust each. The Mk 1 was used for development and flight testing. Five were completed. The Mk 2 version was to be fitted with the Iroquois engine and would be evaluated by RCAF acceptance pilots as well as Avro test pilots. The Astra/Sparrow fire control system had been terminated by the government in September 1958 with all aircraft to employ the Hughes/Falcon combination. At the time of cancellation of the entire program, the first Arrow Mk 2, RL-206, was ready for taxi trials; Avro expected it to break the world speed record, but it never flew. Top speed would have been limited by atmospheric frictional heating, but according to project engineer James Floyd, "[t]he aluminum alloy structure which we favoured was good for speeds greater than a Mach number of 2." 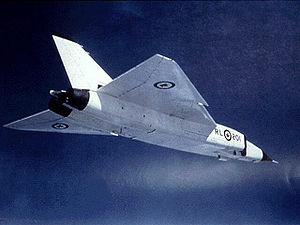 Avro Canada had a wide range of advanced Arrow variants under development at the time of project cancellation. Frequent mention is made of an Arrow that could have been capable of Mach 3, similar to the Mikoyan-Gurevich MiG-25. This was not the production version, but one of the design studies, and would have been a greatly modified version of the Arrow Mk 2, featuring revised engine inlets and extensive use of stainless steel or titanium to withstand airframe heating. A replica Arrow built by Allan Jackson was used in The Arrow, a Canadian Broadcasting Corporation (CBC) production. He began building a full-scale replica of the Arrow in 1989, and was approached by the producers of the Arrow miniseries in 1996, then about 70% complete, who made an offer to complete the construction if the replica could be used for the production. It was used on the miniseries and several public appearances at air shows. The replica was later donated to the Reynolds-Alberta Museum in his home town of Wetaskiwin, Alberta. While in a temporary outdoor collection, it was damaged in a wind storm in 2009. It has since been repaired, but is no longer on public display. The Avro Museum of Canada completed a 0.6-scale remote controlled replica aircraft built for public flight demonstration. Following eight years of research, construction started in September 2000. Built of modern-day composite materials under Canadian Recreational Aircraft legislation, construction involved five years of volunteer labour and half-million dollars in materials and parts. The scale model has been successfully flown on a number of occasions. The Canadian Air and Space Museum, located at the former CFB Downsview, features a full-size replica Arrow built by volunteers with assistance from local aerospace firms. With a metal structure, the replica features many authentic-looking components including landing gear constructed by Messier-Dowty, the original Arrow primary landing gear sub-contractor. Painted in the colours of Arrow 25203, the Arrow replica was rolled out for a media event on 28 September 2006 and was on public display on 8-9 October 2006 to commemorate the original aircraft's rollout in 1957. Royal Canadian Air Force - Arrow was cancelled before entering service. In 1997, the CBC broadcast their two-part miniseries, The Arrow. The production used a combination of archival film, remote-control flying models and computer animation for the static, ground and flying sequences. 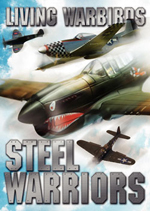 Although highly acclaimed, receiving praise from film historian and former Avro employee Elwy Yost and winner of numerous awards including the Gemini that year, the miniseries was also criticized for its "docu-drama" style and departing from a strict factual account. The continued rebroadcasts and accompanying DVD releases have served to re-animate the controversy over the Arrow's cancellation and introduce the story to a new generation. Abzug, Malcolm J. and E. Eugene Larrabee. Airplane Stability and Control: A History of the Technologies that made Aviation Possible. Cambridge, UK: Cambridge University Press, 2002. ISBN 978-0521809924. Anderson, John D. Jr. Fundamentals of Aerodynamics. New York: McGraw-Hill Science/Engineering, Fifth Edition 2008, First Edition 1984. ISBN 1-42779-659-9. Campagna, Palmiro. Storms of Controversy: The Secret Avro Arrow Files Revealed. Toronto: Stoddart, third paperback edition, 1998. ISBN 0-7737-5990-5. Campagna, Palmiro. Requiem for a Giant: A.V. 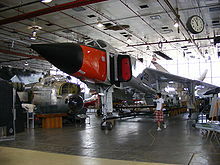 Roe Canada and the Avro Arrow. Toronto: Dundurn Press, 2003. ISBN 1-55002-438-8. Dow, James. The Arrow. Toronto: James Lorimer and Company Publishers, 1979. ISBN 0-88862-282-1. Floyd, James. "The Canadian Approach to All-Weather Interceptor Development. The Fourteenth British Commonwealth Lecture." The Journal of the Royal Aeronautical Society, Volume 62, no. 576, December 1958. French, Francis and Colin Burgress. Into that Silent Sea: Trailblazers of the Space Era, 1961-1965. (Outward Odyssey: A People's History of Space) Lincoln NE: University of Nebraska Press, 2007. ISBN 978-0803211469. Gainor, Chris. 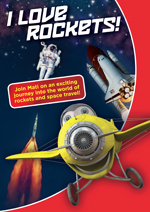 Arrows to the Moon: Avro's Engineers and the Space Race. Burlington, Ontario: Apogee, 2001. ISBN 1-896522-83-1. Gainor, Chris. Who Killed the Avro Arrow? Edmonton: Folklore Publishing, 2007. ISBN 978-1-894864-68-8. Gunston, Bill. 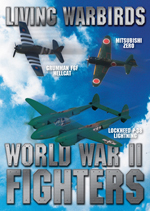 Fighters of the Fifties. North Branch, Minnesota: Specialty Press, 1981. ISBN 0-93342-432-9. Isinger, Russell. "Flying Blind: The Politics Of The Avro Canada CF-105 Arrow Programme." The Evolution of Air Power in Canada 1919 to the Present Day and Beyond. Winnipeg: Department of National Defence, Papers presented at the 2nd Air Force Historical Conference, volume II, 1997. Isinger, Russell. "The Avro Arrow." Canada: Confederation to Present. CD-ROM. Edmonton: Chinook Multimedia Inc., 2001. ISBN 1-894785-00-2. Isinger, Russell. "The Avro Arrow." The Oxford Companion to Canadian History. Toronto: Oxford University Press, 2004. ISBN 0-19-541559-0. Isinger, Russell. The Avro Canada CF-105 Arrow Programme: Decisions and Determinants. MA Thesis, University of Saskatchewan, 1997. Isinger, Russell and D.C. Story. "The Plane Truth: The Avro Canada CF-105 Arrow Programme." In The Diefenbaker Legacy: Politics, Law, and Society Since 1957. Regina: Canadian Plains Research Centre, 1980. ISBN 0-88977-091-3. Lukasiewicz, Julius. "Canada's Encounter with High-Speed Aeronautics." Technology and Culture. The International Quarterly Journal of the Society for the History of Technology, Volume 27, No. 2, April 1986. Milberry, Larry, ed. Sixty Years: The RCAF and CF Air Command 1924-1984. Toronto: Canav Books, 1984. ISBN 0-9690703-4-9. Page, Ron, Richard Organ, Don Watson and Les Wilkinson (the "Arrowheads"). Avro Arrow: The Story of the Avro Arrow from its Evolution to its Extinction. Erin, Ontario: Boston Mills Press, 1979, reprinted Stoddart, 2004. ISBN 1-55046-047-1. Payne, Stephen. Canadian Wings: A Remarkable Century of Flight. Vancouver: Douglas & McIntyre, 2006. ISBN 978-1553651673. Peden, Murray. Fall of an Arrow. Toronto: Stoddart Publishing, 2003, First edition 1978. ISBN 0-7737-5105-X. Shaw, E.K. There Never was an Arrow. Toronto: Steel Rail Educational Publishing, 1979. ISBN 0-88791-025-4. Smye, Fred. Canadian Aviation and the Avro Arrow. Oakville, Ontario: Randy Smye (self-published), 1985. Stewart, Greig. Arrow Through the Heart: The Life and Times of Crawford Gordon and the Avro Arrow. Toronto: McGraw-Hill-Ryerson, 1998. ISBN 0-07-560102-8. Stewart, Greig. Shutting Down the National Dream: A.V. Roe and the Tragedy of the Avro Arrow. Toronto: McGraw-Hill-Ryerson, 1991. ISBN 0-07-551119-3. Stursberg, Peter. Diefenbaker: Leadership Gained: 1956-62. Toronto: University of Toronto Press, 1975. ISBN 0-8020-2130-1. Supersonic Sentinel. Rare Avro Arrow film footage. 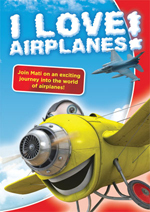 Available from Arrow Digital Archives (ARC); also includes extra footage of the Arrow in flight and some footage of the Avro Jetliner (1950). Valiquette, Marc-Andre. Destruction of a Dream: The Tragedy of Avro Canada and the CF-105 Arrow, Volume 1. Montreal: Marc-Andre Valiquette (self-published), 2009. ISBN 978-2-9811239-0-9. Valiquette, Marc-Andre. Supersonic Dreams: At the Dawn of a New Era, Volume 2. Montreal: Marc-Andre Valiquette (self-published), 2010. ISBN 978-2-9811021-3-3. Whitcomb, Randall. Avro Aircraft and Cold War Aviation. St. Catharine's, Ontario: Vanwell, 2002. ISBN 1-55125-082-9. Whitcomb, Randall. Cold War Tech War. The Politics Of America's Air Defense. Burlington, Ontario: Apogee Books, 2008. ISBN 1-894959-77-9. Zuk, Bill. The Avro Arrow Story: The Impossible Dream. Calgary: Altitude Publishing, 2006. ISBN 1-55439-703-0. Zuk, Bill. The Avro Arrow Story: The Revolutionary Airplane and its Courageous Test Pilots. Calgary: Altitude Publishing, 2005. ISBN 1-55153-978-0. Zuk, Bill. Janusz Zurakowski: Legends in the Sky. St. Catharine's, Ontario: Vanwell, 2004. ISBN 1-55125-083-7. Zuuring, Peter. Arrow Countdown. Kingston, Ontario: Arrow Alliance Press, 2001. ISBN 1-55056-866-3. Zuuring, Peter. Arrow First Flight. Kingston, Ontario: Arrow Alliance Press, 2002. ISBN 1-55056-903-1. Zuuring, Peter. Arrow Rollout. Kingston, Ontario: Arrow Alliance Press, 2002. ISBN 1-55056-902-3. Zuuring, Peter. The Arrow Scrapbook. Kingston, Ontario: Arrow Alliance Press, 1999. ISBN 1-55056-690-3. Zuuring, Peter. Iroquois Rollout. Kingston, Ontario: Arrow Alliance Press, 2002. ISBN 1-55056-906-6. Library and Archives Canada is the official repository of most government documents relating to the Avro CF-105 Arrow project, though there are many documents at the Department of National Defence's Directorate of History and Heritage as well. Almost all Avro Arrow documents have now been declassified. There Never Was an Arrow was broadcast on the CBC in March 1980 (available as an extra on the Arrow Docu-Drama DVD). Clips from the program can be seen at CBC. Avro Canada CF-105 Arrow Pictures and Avro Canada CF-105 Arrow for Sale.